A power meter is an essential tool for nearly every laser user. While Bluefan.nl offers lab services to extensively charaterize your laser many laser users still need a power meter for the smaller tasks. Depending on the power of the lasers you use you need a thermal laser power meter or a photodiode based laser power meter. The Bluefan Basic LPM is a low cost high performance thermal laser power meter for the laser user on a budget. It features a large low noise sensor capable of measuring CW and QCW lasers with great precision and stability. The simple design very easy in use, connect the 9V battery and you're up and running. 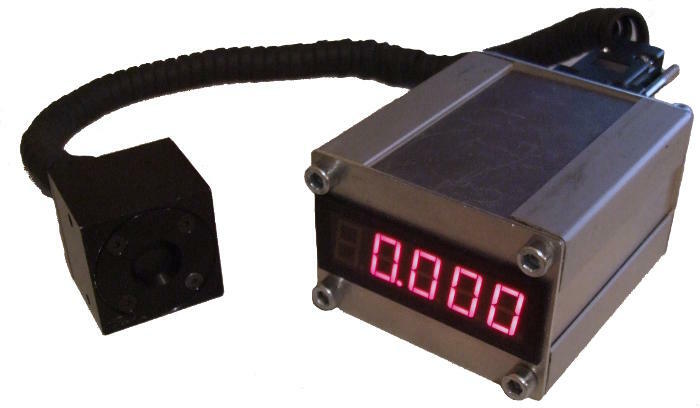 The default laser measurement range of 2W spans most common available lasers while a 1mW resolution allows for low power lasers to be measured. The Range Extender attenuates the reading by a factor of 10, allowing the LPM to measure up to its maximum of 4W continuous or 6W maximum for a duration of 2 minutes. Services such extended LPM calibrations can also be requested at the moment of purchase. The manual of the Basic LPM can be downloaded here: Bluefan Basic LPM MkII Manual. Bluefan.nl offers readouts for Ophir Oem sensors with a 1V/W output. The readouts can be complete units or an OEM circuit to be incorporated into a product by the customer. The laser power meters can be battery powered or line powered.